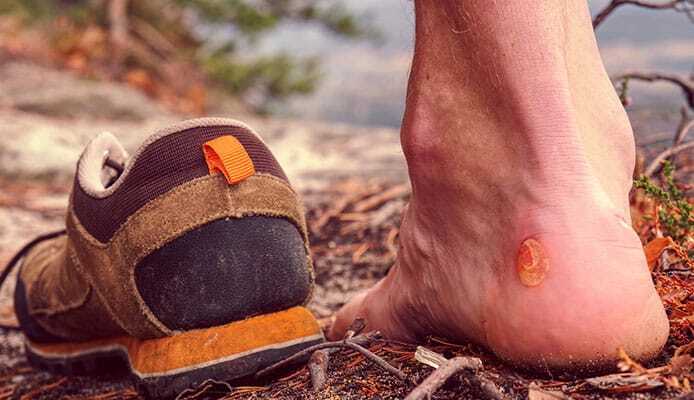 Blisters are probably one of the top three hiking and camping enemies and there are not so many things that could ruin your fun while you explore the wilderness like these little but painful hiking side effects. They are without a doubt the most common injury among the hikers, and there is a great chance that you’ve already had some of these. But unlike the older times, now we know what they are and how to treat them. This article will show you how to do your best to prevent it from creating, but also what to do if it still happens – and the chances are it will happen, no matter how hard you try to prevent it, especially if you’re new to hiking, or you’ve made a big break between two trips. Before we head to the prevention part, it is good to learn what causes them to appear. There are four things that could lead to their formation, and those are pressure, heat, moisture, and above all – friction. If your feet are hot and your shoes don’t provide any air, that will make your skin softer and more blister-prone. The same principle applies for moisture. If your feet are wet or sweaty it means your skin is also softer than normal, so just a small amount of friction could cause the blister. If your boots or shoes have a tight spot, or there is a wrinkle in your sock, this means there could be a constant pressure friction, which wills most likely lead to blister formation. And the main reason, as we’ve already said, is friction itself. If your skin rubs against something for longer period of time, it will result in a painful and bubbly spot filled with liquid that spoils the fun. Also, blister could be caused by burns, skin problems, spider bites, or allergies. Basically, they happen when some part of your body is being constantly under friction, and the cells become damaged. Then the bubble forms and the liquid in it has a purpose of helping that damaged tissue to stay protected and heal better. If you spot red fluid instead of the clear one, it means that some capillary was also damaged. Although sometimes it can be almost impossible and unavoidable to prevent blisters from forming, there are some things that will lower the chance of this happening. If hiking is something new to you and your feet are not used to the activity, you should get hiking shoes a bit bigger than your average size, from half a size to a full size larger. This way you’ll not just avoid possible friction, but also you’ll prevent another big problem that could occur – your shoes becoming too small and uncomfortable due to swelling. Don’t forget – hiking means you’ll be spending lots and lots of time on your feet, which could be quite stressful to them, and even those shoes that felt so comfortable and good when bought could become tight and painful after some time, especially if the outside temperature is hot. To prevent the swelling from causing other issues like blisters, when you go on a search to buy the right pair, firstly make sure they fit good. If the sales person tells you that you should look for those with one finger between your heel and the back of the shoe, don’t listen to them. It is a far better choice to have some extra space that will keep those shoes comfortable even when your feet are swollen. To be sure you’ve gotten the right pair, when you try them on take them for a test ride up and down the stairs, run around a store a bit and jump in them. Then, if they still feel comfortable, move your toes in all directions. If you feel unease, or they feel tight, or something doesn’t feel right, they are not your shoes, it is time to continue looking. You know how it takes time for your feet to become used to your new sneakers, and those sneakers need time before you start to feel fully comfortable in them? The same rule applies here. It doesn’t matter which type of shoes you get and how big they are, it will take some time before you start to feel totally fine wearing them. That’s why you should think about taking your shoes for a walk at least a few times on a shorter distance before you hit the road and take on some lengthy hike. Some will take a few days to fully adapt to your feet, some require weeks of constant usage before you achieve that – like leather boots – but any moment you spend in them will ease it up a bit later. When it comes to your feet, if you’re a newbie, or you’ve been inactive for some time and now plan on coming back to hiking, it probably means your feet will have to get used to hiking again. Not using them will make them lose their toughness, so you’ll need time to get them back to their previous shape. Yes, we know, most of us love to express their style using their shoes, but hiking on a longer distance on a rainy day in your Converse All Stars is not going to end well, nor will hiking in leather or heavy boots on a hot summer day. Check the weather and google out the terrain. It is recommended getting trail runners, as they are lightweight and go easy on your feet, while they also allow them to breathe, this way removing moisture and heat, and lowering the chance of blisters. This is what makes them a great choice for spring, summer or autumn. During the winter, get some boots that are warm, but dry quickly if they get wet and in which your feet could breathe. Remember, the most important thing to think about when it comes to buying the new hiking shoes is safety. Bad choice could easily make them your worst nightmare. Same as shoes, you’ll need pair or two of socks that will help you maintain comfortableness. Try to avoid getting socks that are too big, because having too much loose material mean there is a possibility of friction. On the other hand, if your socks are too tight it could limit the blood circulation, which could lead to swelling. Try to avoid cotton because it sticks to the skin when it becomes wet, and it takes longer to dry. The best choice is woollen thick socks, but if something else works for you, does it that way. There are also some other things you could do before you pack your camping gear and hit the road. Start by pre-taping potential trouble spots. If you’ve had issues with blister before, you probably know where you could expect them to appear, it is good to think about taping them before you start your trip. If you feel so called “hot spot”, or a blister in development, don’t postpone it but stop immediately and take care of it. Any cover will do. The best option is to cover that spot with medical tape, but if you don’t have it, you could use more-less anything similar, like moleskin, bend aid, new skin liquid, or even duct tape, if you don’t have anything before-mentioned. Before your hiking adventure starts, visit your local pharmacy and ask for something you could use in this case. Most of these tapes are not expensive, and they could end up making difference between great memories and a trip you’ll want to forget as soon as possible. Don’t let your feet be in your shoes for too long, and air them as much as possible. Also, make sure you change socks frequently and that your socks are clean. If you have only two or three pairs, wash the one you’ve taken off and place them outside of your pack to dry. Important – do not wash them near the water source; move at least 200 feet from it! Maybe you could also consider wearing liner socks, which will serve as a protective layer. And if you have toenails, trim them before your trip. Alright, you’ve tried everything, but it didn’t help – blisters are there, and now you have to do something to minimize the damage and to make the rest of your trip as pleasant as possible, without the need to go back home early. Will it be painful? Yes, a bit, but it will also help you get back on your feet and hiking as soon as possible. So, what are those blister care hiking skills you’ll have to know? If the blister is small, don’t pop it or remove the fluid as it serves as serum which will help it heal faster, and you’ll lower the chance of infection. If it doesn’t bother you, don’t do anything besides cleaning and adding antiseptic, then covering it using tape or band aid. It should take care of itself. Of if you don’t want to do anything, that’s also OK. Just check it from time to time to make sure it hadn’t burst, but if it stays whole, it will heal on its own. Wash the surrounding area using antibiotic soap. Then clean the blister area using water or antiseptic swab. Take the needle (or a knife, if you don’t have needle) and sterilize it using the flame. You don’t need to set up the fire for this, a lighter will do, or a stove. When sterilized, pop the blister near the foundation and remove the liquid. Apply an antiseptic cream or solution to the blister area. Don’t remove the skin, because it will serve as a protection for the new one that will grow under the cover. Cover the blister area. As stated above, you could use medical tape, but anything else will also do, even a duct tape. If you have Molefoam, cut the blister-size hole in it and put it on. The foam should prevent your sock from rubbing the affected area, but if you want to be extra sure, you could place a layer of Moleskin or medical tape over foam. If the blister pops by itself at any moment, treat it like you’ve popped it, don’t remove the skin, add solution and cover the area. When done, put on the clean socks and you’d be good to go. If you start to feel something funny, and when you remove your shoes and socks you see something red, don’t wait to cover it. This way you’ll provide protection to the affected area and prevent any future rubbing. Before your trip starts, make a checklist of all medical stuff, but you could also look for a book filled with medical advice, or print out recommendations from the internet, but make sure that they come from a reliable source. If you have any doubts, it is not bad thing to go and see your doctor, explain him or her your situation and ask for advice, or to go through those tips you’ve printed, just to make sure you’ll not be doing anything wrong or hazardous. Thirdly, have a doctor phone number on a speed dial. If the blister situation is unbearable, or you don’t know what to do, or the infection appears, it is good to have a professional “on hand” to help you overcome the situation. Relax and don’t worry, it is not wrong to call someone for help. Remember – the fun trip is the safe one, it stops being fun if it goes wrong. Blisters are not something you want to deal with when on a hiking trip, but they do happen, no matter how hard you try to avoid them. Luckily, they don’t have to spoil the fun. This article should help you overcome some smaller problems and continue your trip without a problem. But if these advices don’t help, it is time to call a doctor. No matter what happens, in the end, the most important thing is to learn something and to be prepared next time you put your hiking shoes on.